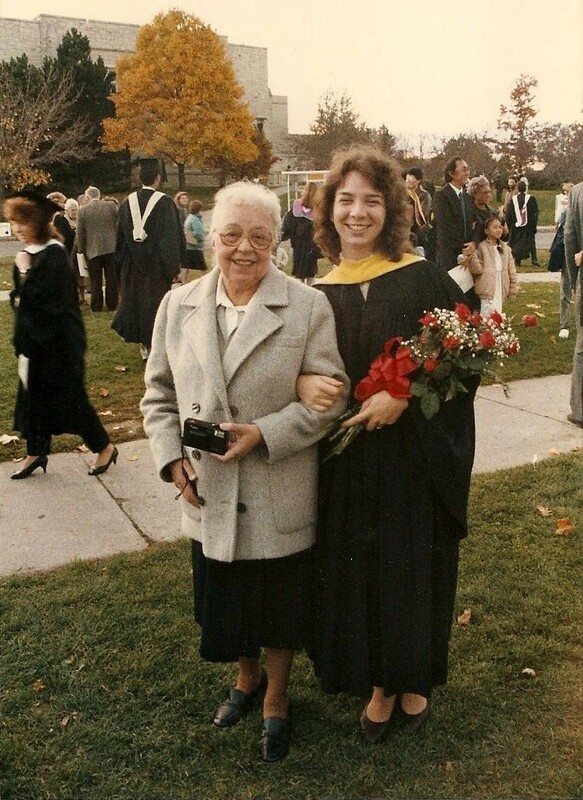 at her MLIS graduation in the fall of 1986. I know when you are beginning your career in librarianship and you are full of wonderful new ideas, you don’t want to listen to the meanderings of a greying librarian. I know because I felt the same way. But luckily I had a couple of wonderful librarians in my life who I had to listen to, so I hope you can bear the history lesson. My mother and grandmother encouraged me to be curious about everything as I was growing up and that has been important for my career as a librarian. My grandmother was also a living lesson in lifelong learning, even before it was a trendy topic in education. At 58 years old, she went back to school to get her MLS. She already had a MA in English (from a university in Paris) and worked in the university library cataloging books, but if she wanted a pay raise, she had to get her degree, so she did. Sixteen years later I graduated from the same library school. As luck would have it, when I went to work at the university my mentor was a good friend of my grandmother’s, Eva Borda. Eva was a nurse who became a medical librarian. She started in an all print world and had to learn how to search the earliest versions of what is now PubMed. She taught me to use the primitive dumb terminal we had at the university sciences library for command language searching. The years I worked at in the university library system were exciting. The dumb terminal gave way to MEDLINE and other databases on CDs, and much better interfaces for librarians searching online, although I still had to learn the command language and field tags for multiple system. Staff were given computers and I made my first library subject pathfinders on a 286 with XYWrite. When my husband graduated, we move to the US for his post-doctoral work. After a short detour teaching genetics, I started as library director for a science research institution. I quickly realized that my work back at the university was only slightly exciting compared to what was happening in librarianship in the 1990s. It started with finishing the catalog automation project started by the previous librarian and then dealing with the start of e-journals. There were no standards, no guarantees for future access, no pricing guides online, in many cases no IP access, just password access which was useless for an institution. I could write a whole post about work/life balance, but it is enough to note that at this point, in 1999, the best decision for my family was for me to ‘retire’ and stay home with my daughters. Because of my experience, it was fairly easy to find part-time work while my daughters were in school, so I continued to learn new computer skills, especially web site and database skills, and I learned about grant writing. In 2004 we moved, which brought me in contact with new part-time experiences. Over the past 10 years I have working part-time for a hospital library, a school of medicine department, and an academic health sciences library. I have learned about intranets, multiple web site development programs, citation management programs, image and research data database programs, integrated curriculum instruction, systematic reviews, NCBI databases, social media, health informatics, and new interfaces for almost every database I search. I have been lucky that some of my positions have supported continuing education and professional development with time and funding, but that has not always been the case. Much of my work has been on an hourly basis, so my continuing education has to be on my own time. Sometimes you need to learn and practice new skills on your own. And sometimes you need to look for opportunities. For instance, I was able to get a scholarship to online courses to earn a graduate certificate in biomedical informatics. And it doesn’t hurt if you find it enjoyable to read the latest news related to the subject areas you are working with. Researchers and other professionals and academics have to continue to learn and update their skills, so it only makes sense that we have to do the same in order to help them with their information needs. When I was interviewed for my current position, I was asked about how I would cope with the change to working with data and I laughed because my whole career as a librarian has been about change. Because I have continued to learn and follow my interests, I had the basic skills necessary to take on research data management. And of course, I continue to seek out new continuing education and professional development opportunities as I move forward in my new job. I hope I never stop learning. Margaret Henderson is Director, Research Data Management and Associate Professor at VCU Libraries, Virginia Commonwealth University. Since she graduated from SLIS at University of Western Ontario, Margaret has worked mainly in science libraries, including 7 years as library director at Cold Spring Harbor Laboratory. She blogs at Life, Librarianship, and Everything and posts on Twitter as @mehlibrarian.